Learning math facts. It’s something that’s just got to be done. Usually the default recommendation is to drill with flash cards. Sigh. I know flash cards aren’t always the worst thing and I do know kids who actually enjoy them. 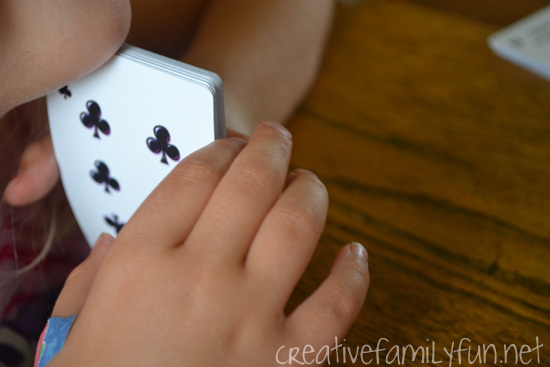 So instead of grabbing flash cards, I grabbed a deck of playing cards to practice our plus 1 minus 1 math facts. 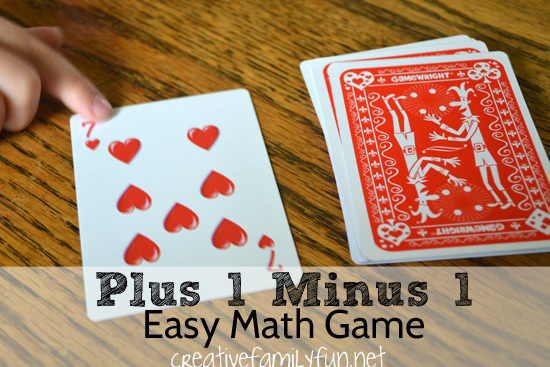 Plus 1 Minus 1 is an easy math game that reinforces the concepts of adding 1 to a number and subtracting 1 from a number. To play the game, remove all the kings, queens, jacks, and jokers from the deck. Shuffle the cards and lay the pile face down. This game can be played by one or two kids. Decide ahead of time whether you will be playing Plus 1 or Minus 1. 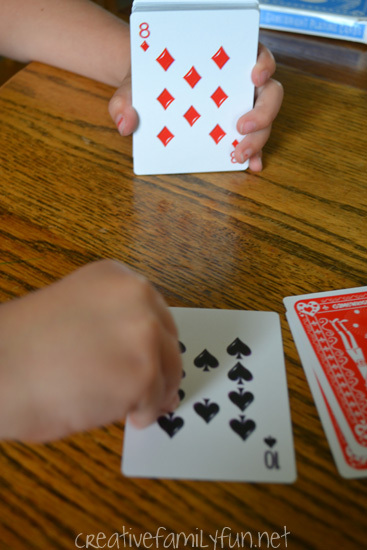 Each player takes turns flipping over the top card on the deck and quickly adding 1 to that number (for Plus 1) or subtracting 1 (for Minus 1). If they answer correctly, they can keep the card. Simple, right? When I play one-on-one with my girls, I flip over the card and my daughter answers. Her goal is to be able to collect the entire deck! Play Plus 2 Minus 2, Plus 5 Minus 5, Plus 10 Minus 10, or whatever set of facts your child needs to learn. It’s very easy to mix up the game. Add a little challenge. If they flip over a red card, they need to add one. If they flip over a black card, they need to subtract one. Play a speed round. How fast can you go? Maybe it’s just my own dislike of flash cards, but I’d much rather play a fun game to practice facts than drill. 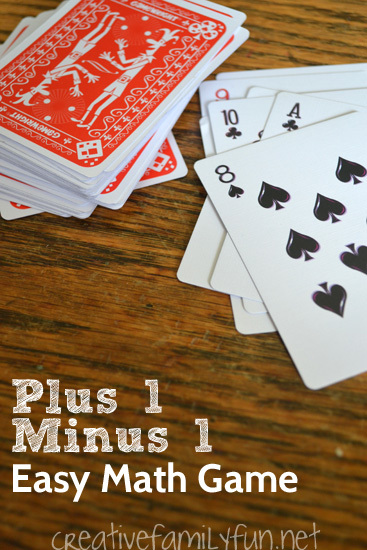 Plus 1 Minus 1 is fun, easy to play, and needs no special supplies other than a deck of cards. Perfect!